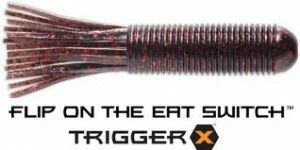 Another bait that Jacob Wheeler used to win the Forest Wood Cup was Trigger X Flippin Tube. This bait is used for catching bass in heavy cover. It can be purchased in a variety of colors and is made of a phthalate free soft plastic composition. This bait is salt infused which gives it the benefit of having better taste, scent and weight. As the angler retrieves this bait, this bait releases pheromones that attract the bass. Retrieving bass on a Pflueger President Casting reel and rod with this bait is sure to make any angler happy with his catch. This entry was posted on Friday, August 24th, 2012 at 8:45 am	and is filed under baitcasting reel, Baitcasting Reels, Knot, Lures. You can follow any responses to this entry through the RSS 2.0 feed. You can skip to the end and leave a response. Pinging is currently not allowed.